So, you’ve written a book — congratulations! What now? Unless you just want your book to sit on your hard drive or print it out to share with a few friends, you have two main choices: (1) write query letters to traditional publishers in the hopes they decide to publish you, or (2) self-publish, releasing your book on your own. This article focuses on the self-publishing option, and specifically self-publishing your work as an e-book through Smashwords (check here for tips on print self-publishing). Once you upload your e-book (as a Microsoft Word document) to Smashwords, they will convert it for you into multiple formats, and then will not only sell it from their own site, but will distribute it to a growing list of e-book retailers, including Barnes & Noble, Kobo, Sony, Apple, and Diesel. The best part about this is that Smashwords doesn’t charge any up-front fees for conversion or distribution (they even give you a free ISBN, which is required to distribute through Apple), they instead keep 15% of the royalties you earn through sales. This allows you to get started with no out-of-pocket expense, and you can remove your books from distribution (or elect only certain channels) at any time. It is up to you to decide whether it is worth a 15% cut for Smashwords to convert your book for you, distribute it to multiple retailers, and consolidate your sales and payment reports in one place. Like I said above, it definitely helps to keep your formatting simple, and follow the instructions in the Style Guide. E-book formatting can be an arduous process when you’re first learning, and it’s easier to follow the Style Guide instead of fighting it. For a little more detail on a weird e-book formatting problem I had (which prevented my books from passing the dreaded ePubCheck), check out this post: Formatting for Smashwords and ePubCheck. I do recommend the Smashwords service, and use it to distribute my own novels. Check them out on Smashwords here! I appreciate being in such great company! 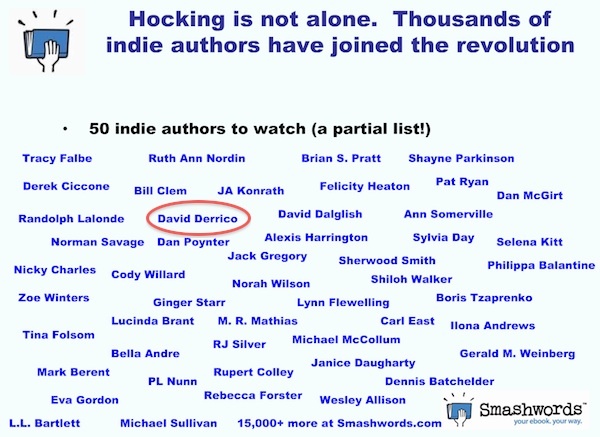 I received a pleasant surprise tonight when catching up on my blog reading: Mark Coker, founder of the e-book distribution service Smashwords (which I use to distribute my e-books to Kobo, Apple, and Sony) mentioned me as one of “50 indie authors to watch” on his latest blog post, which includes a presentation about the upheaval of the publishing industry. As more and more self-published authors like Amanda Hocking and J.A Konrath “break out” (Hocking is closing in on 1 million e-book sales! ), and e-books garner a larger and larger share of the book market, we will reach a tipping point where big-name authors wonder why they’re giving publishers the lion’s share of their book proceeds. They’ll compare the 8%–17.5% royalties they get from legacy publishers to the 70% they can earn on their own. They’ll realize they can pay a fixed fee to skilled editors and cover designers and formatters, and retain artistic control, pricing flexibility, and the majority of the proceeds. And they’ll realize they can achieve worldwide distribution through Amazon and services like Smashwords, without their legacy publishers. The authors on the list above have proven that legacy publishers are missing out on — actually, rejecting is the better word — some very talented authors. Do check out Mark’s blog post and presentation here, and check out Smashwords to find some very good, inexpensive, DRM-free e-books in multiple formats from some of these talented indie authors. I’ve just spent the day trying to figure out why my latest novel, The Twiller, hadn’t been uploaded to the Apple iBook Store through Smashwords, even though I had uploaded it over a month ago. Mark Coker was kind enough to email me back and let me know that the ePub file (which Smashwords’ “Meatgrinder” automatically generates from a Microsoft Word .DOC file that I upload) wasn’t passing the dreaded “epubcheck” utility. And Apple doesn’t accept e-books that don’t pass epubcheck. After a good amount of research and frustration, I thought I’d share my findings (and simple solution!) here in the hopes that another author might stumble across this and save some time. (These were repeated several times, for each chapter or section in my e-book.) By opening the ePub file in Sigil, I was able to figure out that line 12 of each section was the “Author” attribute, and line 33 was an attribute called “Matter No.” The simple fix involves opening your Word document and clicking on File ——> Properties. Somehow, the “Author” name was set as “( )”, which epubcheck didn’t like. So make sure at least your title and author name are filled in, and they should probably be only letters (no weird symbols). Since I didn’t have this problem with my first two e-books, and I recently “upgraded” (yes, I use the term loosely) from Word 2004 for Mac to Word 2008 for Mac, I figure that might be the culprit. In any event, fortunately, the solution is simple — just tidy up the “Title,” “Author,” and any custom fields your document has under Word’s “Properties…” dialog in the “File” menu. I just uploaded the new version to Smashwords, and it passed epubcheck, so it will hopefully show up in the Apple iBook Store soon! • Mark Coker, founder of the wonderful author service Smashwords, posted about Right Ascension as one of the first Smashwords books available on the iPad. 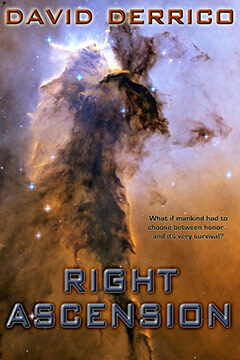 David Derrico’s sci-fi novels Right Ascension and Declination are both $0.99 in e-book format from Amazon or Apple. I’ve read the first and I’m working on the second novel. Both are excellent alternatives to expensive e-books. There are many self-published authors in various genres, both fiction and non-fiction, with affordable and highly readable e-books. I think established publishers are sinking their own ships (and their authors as well) with their pricing strategies. Thanks for the mention, Roger, I’m glad you’re enjoying them!